Little hands and big imaginations will love these friendly wooden safari animals with oversized noses! 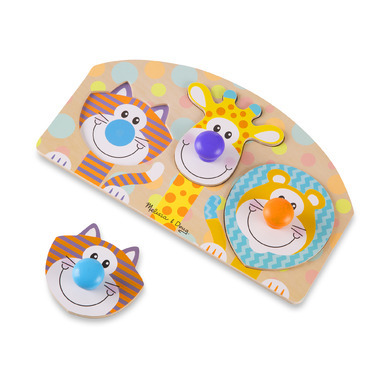 The smiling tiger, giraffe, and lion have wooden knobs for noses that are easy to grasp. 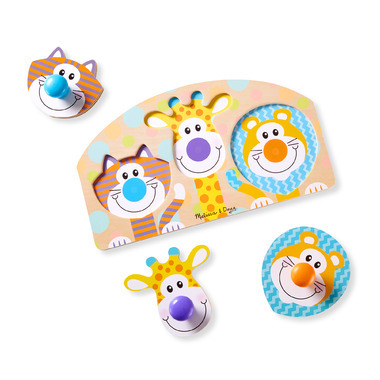 Babies and toddlers will delight in matching pieces to pictures on the sturdy wooden 14-inch by eight-inch puzzle board, discovering colors and patterns, and developing fine motor skills. First Play puzzles and toys feature bright colors, bold patterns, and whimsical designs that boost skills while sparking imagination and wonder—right from the start! Great little puzzle for my one year old granddaughter. Colorful and age appropriate. She loves it.